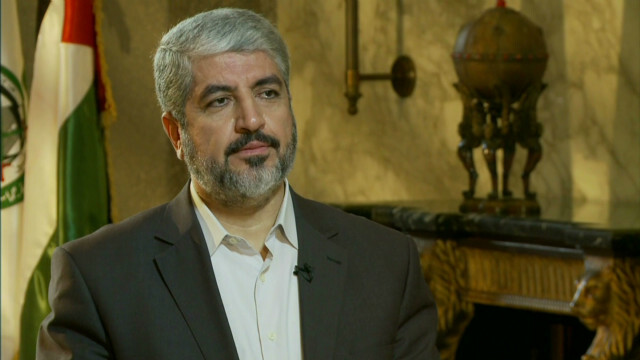 Khaled Meshaal , the political leader of the Palestinian organization Hamas, spoke exclusively with Christiane Amanpour from Cairo, Egypt for the Wednesday, Nov. 21st edition of Amanpour. Amanpour pressed him on whether his organization was responsible for the bombing of a civilian passenger bus in Tel Aviv, whether Hamas would agree to a ceasefire with Israel, and under what conditions Hamas would agree to recognize the State of Israel. AMANPOUR: You say you would prefer the route that did not cause so much violence, so much death. And yet, you say that you would accept a two-state solution, but that you will not recognize Israel’s right to exist. Is that still the case? This idea (ph), this touch failed experiences, we have two options. No other. Either there’s an international will, led by the U.S. and Europe and the international community and force Israel to go through the way of peace and a Palestinian state, according to the border of 1967 with the right to return. And this is something we have agreed upon as Palestinians, as a common program. But if Israel can continue to refuse this, either the — either we force them or resist to — resort to resistance. I accept a state of the 1967. How can I accept Israel? They have occupied my land. I need recognition, not the Israelis. This is a reversed question. The full transcript of this program may be found here. This edition of Amanpour aired on Wednesday, Nov. 21 on CNN International at 3:00pmET in the North America. In Europe, Amanpour airs on CNN International at 21:00 CET.